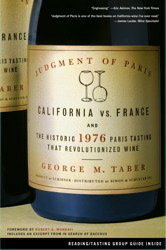 The small and little noted tasting in Paris in 1976 of several Californian wines against the top echelon of the French wine industry sparked horror in France and pride in the USA where for the first time hard evidence existed showing the American wine industry as a force to be reckoned with. George Taber, then a reporter for Time and the only journalist to attend, chronicles this event, the history that made it possible and the aftermath in this highly entertaining look at the birth and rise of the American wine scene. Follow first the lives of the colorful immigrants who labored in the aftermath of Prohibition to rejuvenate a nearly defunct wine region as they lay the foundation for the rise to stardom. Taber gives detailed accounts of two of the winning wineries; Stag’s Leap and Chateau Montelina as well as several other influential characters. The detailed first-hand account of the tasting set up by Steven Spurrier (Decanter) is both suspenseful and amusing as the author ponders over the French wine elite’s inability to tell the difference between American and French wines. Finally Taber tackles current trends in the wine industry including globalization and heterogeneity and the rise of the international wine star and flying consultants. Overall a very entertaining wine book recommended for anyone interested in the old world versus new world battle or in the history of the American wine region.